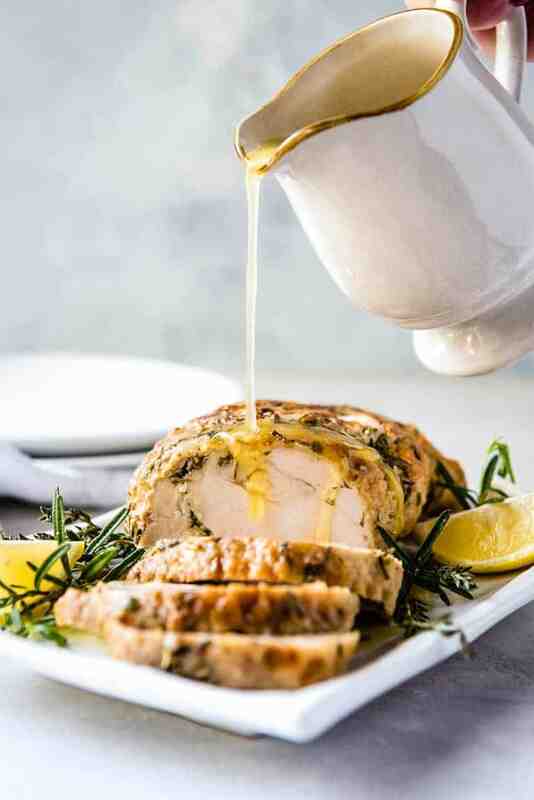 With this recipe for Instant Pot Turkey Breast with Garlic Butter Gravy you can make moist and juicy turkey and gravy in less than an hour! 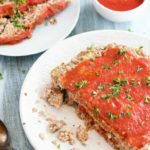 So easy and so delicious, you will not only want to make this for Thanksgiving but all year long as well. 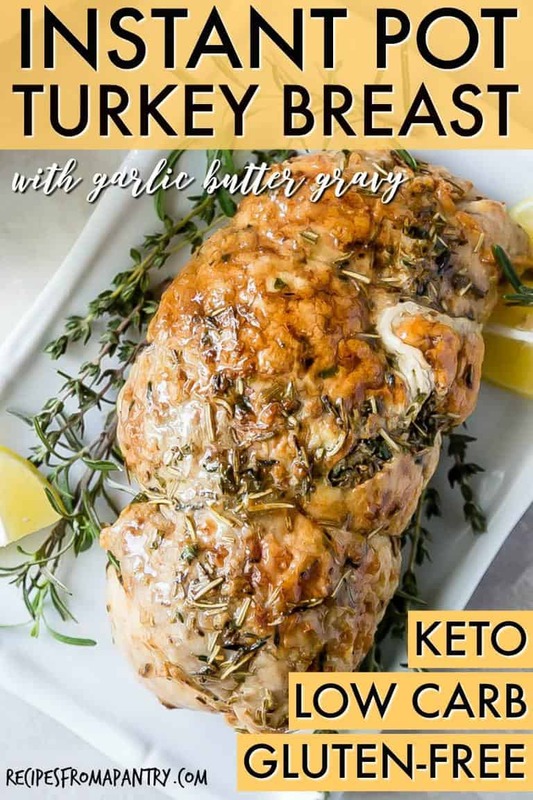 Suitable for Gluten-Free, Low Carb and Keto diets. Post includes Weight Watchers points. It is officially comfort food season, peeps. One of the meals I crave the most at this time of year is a nice hearty plate of turkey with rich and buttery gravy. Satisfying this craving would typically require me to make it an all-day affair. First I have to run out and buy a bird, then there is the prep to get it in the oven. Followed by basting and monitoring the cooking process for several hours. But I have discovered there is another way. A much faster way. 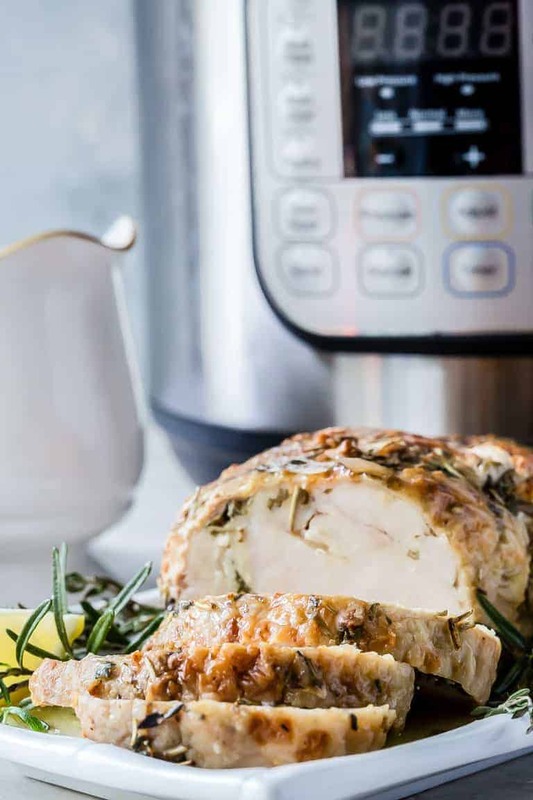 And this recipe for Instant Pot Turkey Breast with Garlic Butter Gravy is the answer. Just when I thought I couldn’t love my Instant Pot any more. The Instant Pot truly does make it sooooooo easy. No basting, no need to constantly check the progress. Just put your turkey breast in the magical pot, set it, and walk away. Yeap. Thanksgiving dinner and holiday meals just got a whole lot easier. After realising just how simple it is to make Instant Pot Turkey Breast I decided to take it to the next level by using a coriander seed butter rub to really infuse the meat with tons of flavour. I discovered my love of coriander seeds after trying biltong is South Africa and now use them regularly for meat. Whilst the addition of coriander seeds is not mandatory it really does give the turkey a fab taste and is worth a try. Mix together butter, herbs, coriander seeds, garlic purée and salt to form a paste. Rub ⅓ of the butter under skin and ⅓ butter on top, and reserve final ⅓. Add the stock to the Instant Pot insert. Place the trivet inside the Instant Pot and set the turkey breast on top of trivet, skin side up. Close the lid and turn the valve to the sealing position. Set for manual/high pressure of 35 mins. Once cook time is completed, allow for a full natural pressure release. Take the turkey breast out of the Instant Pot and place on a baking tray. Rub with remaining butter and then broil until it is browned to your liking. Transfer broth from the Instant Pot into a small saucepan. Stir in xanthan gum and lemon juice and simmer until the gravy thickens. Adjust seasonings to suit your taste and serve. Let the turkey rest for at least 10-15 mins before slicing. You want to make sure all the delicious juices stay in the meat. I recommend slicing the meat thinly and against the grain. Vary the herbs to suit your taste. Parsley, sage, tarragon, basil and oregano all work well. Brown and crisp the skin with a kitchen torch (of you have one) instead of broiling. If you are not following the Keto diet, you can use cornflour to make the gravy (see section below for step by step instructions). Use your leftover Instant Pot Turkey Breast (if there is any) to make this Crunchy Healthy Turkey Salad. Rubbing the herb butter paste both on top and underneath the skin is key for achieving maximum flavour. Use your hand to loosen the skin away from the breast, then push the butter mix into the gap, covering as much of the turkey breast as possible. Rub the rest of the butter mixture on top of the turkey breast skin. What is the Proper Temperature for Turkey? You should always use a meat thermometer to check the internal temperature of your turkey breast to make sure it is safe to eat. Make sure to insert the thermometer into the thickest section of the breast to get an accurate read. The meat is ready to serve when the internal temperature reaches at least 165F / 74C. Cut 2 whole heads of garlic in half and put them in the bottom of the slow cooker. Set the turkey on top of the garlic halves, using them like a trivet (to keep the turkey elevated out of the juices that will release during cooking). Cook for 6-7 hrs on low till the internal temperature of the turkey reaches 165F / 74C. Remove the turkey from the slow cooker, set on a baking tray and broil to brown and crisp the skin, if desired. Use the juices in the slow cooker to make the garlic butter gravy following the steps listed above. Important note: if you are planning to use a frozen turkey breast thaw the turkey completely (using one of the two methods below) before slow cooking to avoid any risk of harmful bacteria contaminating the meat before it reaches a safe cooking temperature. You can safely thaw your turkey in the refrigerator or submerged in cold water. A 3lb boneless turkey breast needs to be thawed in the fridge for a minimum of 24 hours or submerged in cold water for 2 hours, changing the water every 30 minutes. Make sure the turkey is securely wrapped so the water is not able to get inside. Once the turkey is completely thawed, cook it immediately. Do not refreeze thawed turkey. Is Xanthan Gum Considered Keto? Xanthan gum is a thickener that is popular in keto and low carb cooking. Since it is a soluble fiber and does not contain any calories or other nutrients, it does not need to be counted toward daily carbohydrate totals. 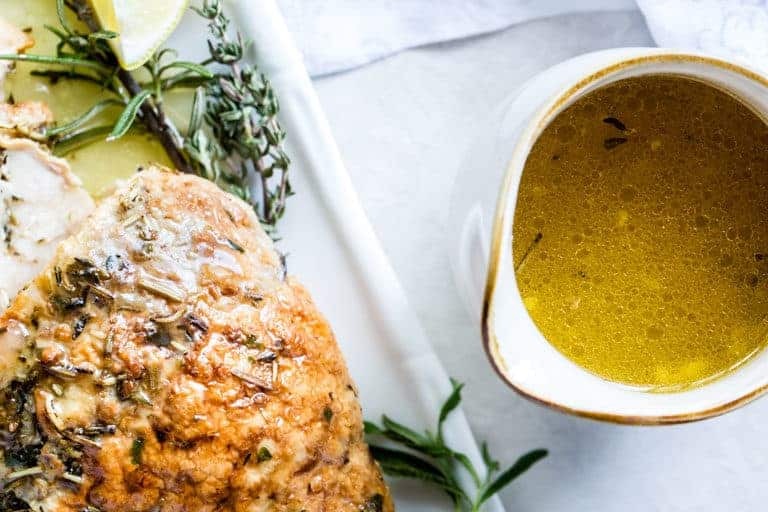 Using xanthan gum to thicken the Garlic Butter Gravy in this recipe makes it both low carb and Keto friendly. Transfer the broth from the Instant Pot into a small saucepan. In a small bowl, make a paste with your cornflour by mixing 2 to 3 tablespoons with an equal amount of water. Whisk the paste into the broth and simmer until the gravy thickens. Mix in the lemon juice, adjust seasonings to suit your taste, and it’s ready to serve. 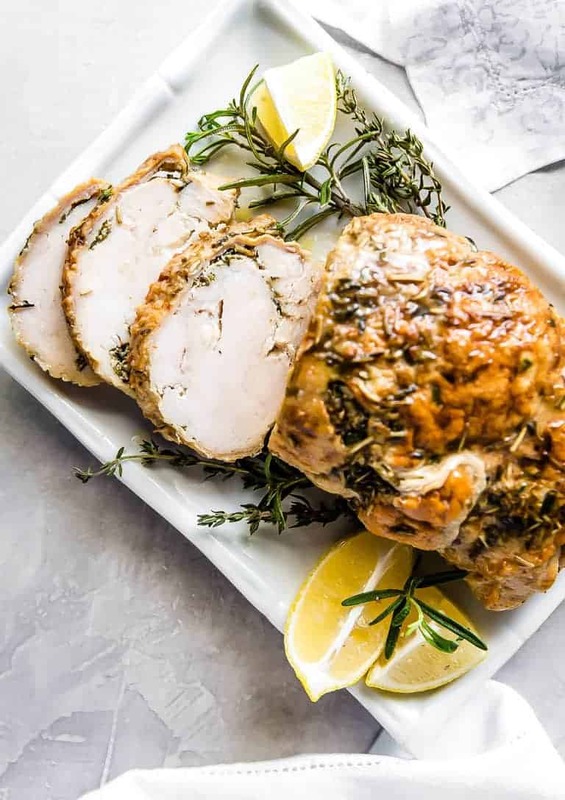 Instant Pot Turkey Breast Thanksgiving Menu (Christmas Menu). If you were wondering what to serve with Instant Pot Turkey Breast with Garlic Butter Gravey for part of a Thanksgiving menu and Christmas menu, then here are a few ideas. There are 6 Freestyle Points in one serving of InstantPot Turkey with Garlic Butter Gravy. Thank you for reading my Instant Pot Turkey and Garlic Butter Gravy recipe post. And please come visit again as I continue dreaming up recipes, traditional African recipes, African fusion recipes, Sierra Leone recipes, travel plans and much more for you. Thanks for supporting Recipes from a Pantry, UK food blog. Don't forget to tag #recipesfromapantry on Instagram or Twitter if you try Instant Pot Turkey Breast with Garlic Butter Gravy! It is really, really awesome for me when you make one of my recipes and I'd love to see it. You can also share it on my Facebook page. Please pin this recipe to Pinterest too! Thank you for reading Recipes from a Pantry. Learn how to make delicious Thanksgiving quality turkey and gravy in less than an hour! Rub ⅓ of the butter paste under skin and ⅓ butter on top and reserve final ⅓. Add stock to the Instant Pot insert. Add trivet to the Instant Pot and then place the turkey breast on top of trivet, skin side up. Place the lid on the Instant Pot and turn valve to the sealing position. Set to manual/high pressure for 35 mins. When cook time is completed allow for a full natural pressure release. 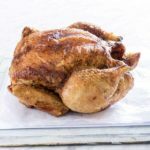 Take turkey out of the Instant Pot and place on a baking tray. Rub with remaining butter paste and broil until it is browned to your liking, approximately 8-10 minutes. Transfer broth from Instant Pot into a small saucepan (add 2-3 tbsp of stock if you don’t have enough liquid). Add xanthan gum and lemon juice. Simmer until the gravy thickens, 4-5 minutes. Adjust the seasonings to taste, and serve. In a small bowl, make a paste with your cornflour by mixing 1 to 2 tablespoons with an equal amount of water. Mix in the lemon juice, adjust seasonings to suit your taste, and it's ready to serve. Brown and crisp the skin with a kitchen torch (if you have one) instead of broiling. There are 6 Freestyle Points in one serving of Instant Pot Turkey with Garlic Butter Gravy. What?! 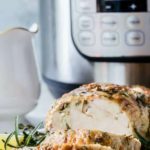 Turkey in the Instant Pot?! This is amazing!! I randomly thought about using the instant pot for turkey and here it is! Yours looks delicious. Sadly, I didn’t love biltong in South Africa, but I fell in love with many other foods there and in Zimbabwe! Such an amazing gluten free meal. Perfect for thanksgiving as I am trying to plan what to make. I’ve been waiting for all the crockpot/turkey recipes…but they almost always use ground turkey which isn’t what I was looking for. We would do just fine with the breast only, so that’s a great thing.